Now that light heavyweight king Jon Jones (Pictured) has been confirmed as the featured attraction for the UFC’s return to Atlanta, Georgia, it’s time to alert those planning to be in the ATL on April 21st when tickets for the extravaganza will be made available. UFC Fight Club members will have the opportunity to purchase seats for the show on Wednesday, February 15th at 10AM ET/7AM PT. A special Internet ticket pre-sale will be available to UFC Newsletter subscribers on Thursday, February 16th at 10AM ET/7AM PT. The general public will have access to the remains on Friday, February 17th at 10AM ET/7AM PT via Ticketmaster. Official UFC VIP packages will also be available for this event. The bundle includes tickets to the show, official event merchandise, as well as special VIP experiences with backstage tours and meet and greets with top Octagon stars. 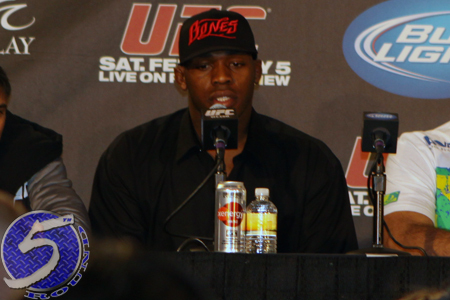 Assuming Rashad Evans doesn’t suffer any setbacks, “Suga” will challenge Jones for his crown in the night’s main event.